Initially, the only electric loads encountered in an automobile were for lighting and the starter motor. Today, demands on performance, safety, emissions, comfort, convenience, entertainment, and communications have seen the working-in of seemingly innumerable advanced electronic devices. Consequently, vehicle electric systems require larger capacities and more complex configurations to deal with these demands. 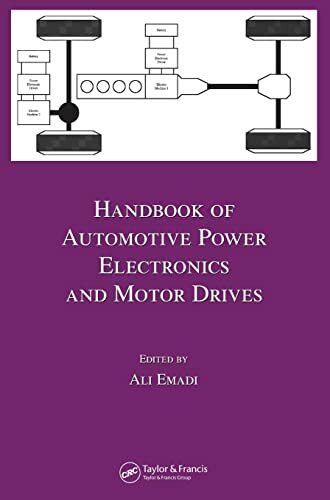 Covering applications in conventional, hybrid-electric, and electric vehicles, the Handbook of Automotive Power Electronics and Motor Drives provides a comprehensive reference for automotive electrical systems. This authoritative handbook features contributions from an outstanding international panel of experts from industry and academia, highlighting existing and emerging technologies. Divided into five parts, the Handbook of Automotive Power Electronics and Motor Drives offers an overview of automotive power systems, discusses semiconductor devices, sensors, and other components, explains different power electronic converters, examines electric machines and associated drives, and details various advanced electrical loads as well as battery technology for automobile applications. As we seek to answer the call for safer, more efficient, and lower-emission vehicles from regulators and consumer insistence on better performance, comfort, and entertainment, the technologies outlined in this book are vital for engineering advanced vehicles that will satisfy these criteria.